“Don’t just influence the conversation; be the conversation!” tweeted Apra International and Apra-MOKAN member Amanda Wagoner. Wagoner, funding coordinator for the Foundation for Barnes-Jewish Hospital, was reacting to presentations during the Apra-MOKAN spring conference. Her tweet summarizes how Apra’s Advocacy Committee began its inaugural year: encouraging Apra members to share their stories of advocacy in order to be the advocacy conversation we know our membership wants. The Apra Board of Directors saw the need for advocacy to support our members and profession. As a result, the Advocacy Committee was formed in September 2015. The committee is committed to implementing Apra’s strategic vision to raise the profile of our profession and empower prospect development professionals to take ownership of their critical role within the fundraising industry. During Apra’s annual Chapters Share the Knowledge event, the Advocacy Committee hosted a panel of members speaking candidly about their experiences with advocacy, offering words of wisdom for Apra members to learn from and expand upon. The panelists shared successes, such as advocating for prospect development’s role in an organization when interviewing for a job, as well as working with leadership to expand a position to do prospect development a majority of the time rather than part of the time, and finding a way to promote prospect research when colleagues don’t understand the benefit of the work you do. The recording is available on the Apra website under Events/Chapters Share the Knowledge. The Advocacy Committee provided Apra chapter leaders with a presentation highlighting a sample of advocacy stories from strong and diverse voices of Apra members. Chapters were encouraged to incorporate these stories into their programming in a way that would start the advocacy conversation at a grassroots level. Apra-MOKAN utilized the presentation for round-table discussions on advocacy during its April conference and provided attendees with the stories so they, in turn, could share them with others. For a copy of the presentation, email info@aprahome.org and type Advocacy Presentation in the subject line. The Advocacy Committee is excited to hear and share more stories and voices of advocacy in our profession. Be on the lookout for your opportunity during Prospect Development 2016 in Nashville to share your thoughts, experiences and hopes of advocacy for you, your team and the profession. If you want to share your story with us now, please email info@aprahome.org and type Advocacy Story in the subject line. Apra has created valuable strategic partnerships with other professional associations to demonstrate the value of prospect development within the fundraising industry. The Advocacy Committee will oversee the continuation and growth of these partnerships, such as those with CASE District V, the Association of Independent Information Professionals, Rice University Center for Philanthropy and the Association of Fundraising Professionals. The Advocacy Committee is beginning to outline and create an Advocacy Toolkit for members. Having a resource for prospect development professionals to support the elevation of our profession is key to the conversation. The committee is excited to expand its scope and work for the benefit of Apra members now and in the future. Advocacy takes many forms, so we are still working to define it. It is a conversation and dialogue we are thrilled to continue. 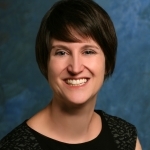 Amy Turbes currently holds the position of senior director of strategy, research and development at Creighton University. She has worked in prospect development at Creighton for 10 years. As an Apra member, Turbes has been involved with several committees, including chair of the education and professional development committee and member of the nominations committee and the curriculum planning committee. Her first introduction to the prospect development community was with the Apra-Great Plains Chapter where she previously served as chapter president, conference chair and member-at-large.